Noel Gallagher is on track to join his brother Liam in scoring a number one album in 2017. The former Oasis star’s third record with Noel Gallagher’s High Flying Birds is heading for number one on the official albums chart following its release on Friday. Who Built The Moon? has moved 57,000 copies across physical, digital and streaming equivalent sales in its first three days and looks like securing top spot seven weeks after brother Liam’s debut solo album did the same. 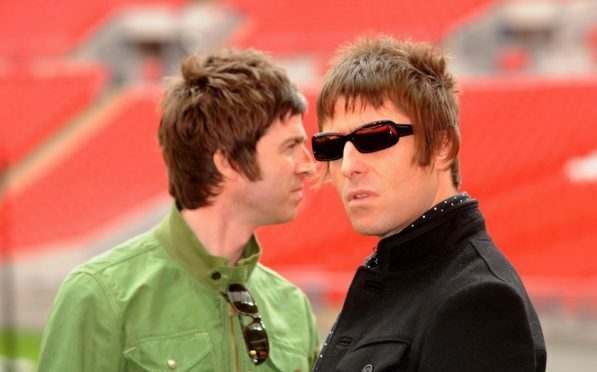 The brothers have enjoyed a long-running antagonistic relationship, with Oasis splitting in 2009. Noel’s first two High Flying Birds albums also hit number one in their first week of release. His third effort’s nearest competition comes from Little Mix who are on course for a second-placed finish with a new platinum edition of Glory Days while Sam Smith’s The Thrill Of It All drops to third. Bjork’s ninth album, Utopia, is on course to enter at 21 while last year’s X Factor winner Matt Terry’s debut album will hit 27 if combined chart sales remain at their current rate. Elsewhere in the top five, Elvis Presley’s Christmas album with the Royal Philharmonic Orchestra is on track to rise to fourth spot after starting the week outside the top 100 while Michael Ball and Alfie Boe’s Together Again is currently in fifth. The singles chart is a three-horse race at the midweek stage with Camila Cabello’s Havana hanging on to number one at the midweek stage. Just 200 combined chart sales separate the track, which features Young Thug, from Rita Ora’s Anywhere while Ed Sheeran’s Perfect is on their tails in third. Marshmello and Khalid’s Silence is currently in fourth while Big Shaq’s Man’s Not Hot is gaining ground as it rises to fifth. James Arthur’s new single Naked is on course to be this week’s highest new entry at number six ahead of Clean Bandit and Julia Michael’s I Miss You. And K-pop outfit BTS could net their first UK Top 40 placing on Friday with Mic Drop currently at 30 following their American Music Awards performance.